Margarito Blanco films a traffic stop in Phoenix, Arizona on Thursday, April 29, for evidence of racial profiling. Phoenix, Arizona (CNN) -- Margarito Blanco trains his camcorder on the officer approaching a Chevy pickup, while his friend Andrew Sanchez furiously scribbles notes on a pad. They are not working for the police. They're watching them. It's about 8:10 p.m. on a recent Thursday and the turquoise S-10 is pulled over at a Circle K gas station in Phoenix. Anywhere else in the United States, this might appear to be nothing more than a routine traffic stop. But Phoenix is ground zero in the battle over illegal immigration, and to Blanco and Sanchez the stop represents a potential opportunity to catch a member of the Maricopa County Sheriff's Office in the act of racial profiling. CNN accompanied the pair as they cruised around Phoenix looking for traffic stops to document on the Thursday after Gov. Jan Brewer signed what's being called the nation's toughest anti-immigration enforcement law, SB 1070. Although critics nationwide say Arizona's law allows police in the state to detain people based on race, grass-roots activists like Sanchez and other self-styled "cop-watchers" say racial profiling is nothing new here. They say SB 1070 stands to make matters worse. "The Maricopa Sheriff's Office has been doing it for years, but this new law gives them the legal authority to stop people with even less reason for doing so," Sanchez told CNN. The law, which takes effect in August, requires immigrants to carry their alien registration documents at all times and allows police to question people if there is reason to suspect they are in the United States illegally. The new law also makes it a state crime to live in or travel through Arizona illegally, targeting those who hire undocumented day laborers or knowingly transport them. In response to concerns that the law encourages police to racially profile, Brewer and the legislature amended it to specify that police can stop suspected illegal immigrants only while enforcing another law or ordinance. Sanchez, an American-born community activist from the Arizona town of Guadalupe, began engaging in reverse police surveillance a year ago. "Most of the time, we expect law enforcement to do their jobs properly," he said. "But we want to be there to monitor and observe in case they stop someone based on the color of their skin, because who else is going to do it?" The traffic stops are among the most public aspects of Maricopa County Sheriff Joe Arpaio's hard line approach to what he calls "crime suppression and illegal immigration enforcement." Since 2008, the Maricopa County Sheriff's Office has staged 15 street patrol operations targeting areas suspected to have high concentrations of crime related to illegal immigration. Arpaio himself announces each operation with a press release and news conference a few hours before deputies and so-called "posse volunteers" take to the streets. This new law gives them the legal authority to stop people with even less reason for doing so. Arpaio's approach has drawn both criticism and praise, with supporters crediting the department with enforcing immigration laws already on the books. The passage of SB 1070 has thrust the media-friendly "Sheriff Joe" back into the spotlight as an ardent defender of the legislation, and he vows to uphold it. 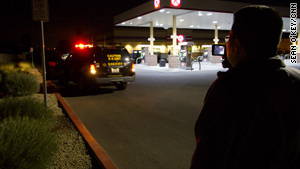 The traffic stop CNN witnessed with Sanchez was part of an operation focusing on the west Phoenix community of Maryvale. Arpaio describes the area as a hub for drop houses used by human traffickers that's also a crossroads of transportation routes to move illegal immigrants throughout Arizona and beyond its borders. "MOUNTING PRESSURE WILL NOT DIMINISH ARPAIO'S RESOLVE TO ENFORCE IMMIGRATION LAWS," a news release from Arpaio's office on the operation stated in bold, underlined, red letters. Anticipating criticism that the sweeps were being launched to promote the new legislation, the release noted that they had been planned before the law was passed. "I've discussed this operation long before the bill's passage with several media people always saying it would occur at the end of April," Arpaio said in the release. "We will not be deterred, and we will be extra vigilant with an eye toward officer safety. Lots of people are angry right now which translates to more danger posed for cops." A follow-up news release said 93 arrests were made that Thursday, and that 63 of those arrested were suspected of being illegal aliens. "The illegal alien arrests were the result of six separate vehicles stopped for traffic violations and were found to be smuggling illegal aliens out of the valley to other locations of the country," the release said. Lots of people are angry right now which translates to more danger posed for cops. Sanchez, who has himself been arrested in what he says was a case of racial profiling, has garnered his fair share of publicity in Arizona as a community activist and cop-watcher. His family's claim that the sheriff's department has retaliated against them for their activism was the subject of a 2009 cover story in the alternative newspaper Phoenix New Times. Sanchez carries a binder containing copies of arrest reports, affidavits, lawsuits and tickets documenting his family's history of legal travails, some of which are ongoing. His experiences, along with stories he has heard from members of the community, encouraged him to take his community activism a step further by participating in cop watches. As soon as an operation is announced, the cop-watchers head somewhere with a Wifi connection -- a home or Starbucks -- to monitor police scanners. They send text messages of the locations of stops to others who, like Sanchez, cruise the area. They usually travel in pairs and try to reach the stop while it is in progress so they can record it and document it. On the night CNN accompanied them, Sanchez and his partner pulled into the Circle K just as the deputy, sporting a crew cut and bulletproof vest, took the man's license to his partner inside the vehicle and conferred with him. A few moments later, he brought the license back to the driver, returned to his patrol SUV and drove away. As the driver pulled the pickup to a gas pump, Sanchez and Blanco walked over and peppered him with questions: Why did they stop you? What did they say? Did they give you a ticket? The driver said the officer initially spoke to him in Spanish, telling him he was pulled over because the temporary tag affixed to the truck's cab window was not properly illuminated. As the man rattled off details, Sanchez nodded, interpreting the incident as an example of racial profiling. "Just the fact that he started speaking to him in Spanish shows that he approached him with a certain idea in mind of who he was," he said. "Also, there are hundreds of people driving around with temporary license plates. If this guy were in another part of town, he wouldn't be pulled over." The guy seemed a little bit nervous and [the officer] thought it was because he had a felony warrant. But the Maricopa County Sheriff's Office sees it another way. The temporary tag was not visible in the back of the cab, so the deputy felt obligated to pull the driver over to verify it, a sheriff's spokesman said. "He didn't see the license clearly displayed or illuminated," said the sheriff's office spokesman, Lt. Brian Lee. "There might have been some graphics in the window, like a sticker that impeded his view, and it was dark and he had a hard time seeing it." The deputy did not even notice what the driver looked like until he pulled him over, Lee said, noting that the officer had a hard time remembering the incident from the many other car stops he made that night. The deputy did recall, however, that the driver had an outstanding felony warrant from another state, Lee said. The details of the warrant were not available to the deputy because it was not an extraditable offense, and so the officer decided to let the man go. "The guy seemed a little bit nervous and he thought it was because he had a felony warrant but it was not an extraditable offense," Lee said. "Obviously if the deputy gets information that a guy has a warrant then his level of awareness goes up a bit." Lee said the department takes complaints of racial profiling very seriously, noting that the driver never called in to report the stop. He also defended the department's proactive stance on enforcing immigration laws. "We don't back off because we don't feel we're doing anything wrong. We act professionally, we follow the law," he said. "It would be silly for us to engage in this type activity especially when we've invited the media and let the public know what we're doing."